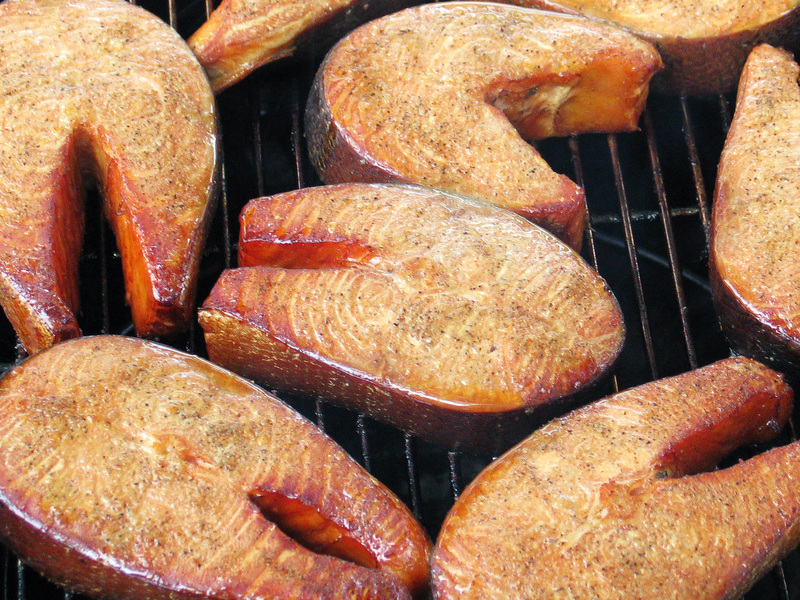 We’ve only used salmon steaks for this so far…the skin helps keep the fish together both during brining and smoking. 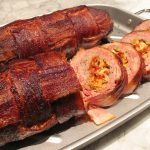 This is a favorite, it’s only about an hour on the smoker, everything can be prepped well in advance, and it goes with everything! We just enjoyed some brilliant leftovers the other day out of the freezer…so make extra if you’re putting in the effort – enjoy! Rinse the salmon steaks and whisk together the brine mix in a large bowl – mix well to give the sugars and salt time to dissolve. You can either brine in a large casserole, or a large bowl – I prefer using a large Ziploc supported by a large bowl because it’s easier to maneuver in and out of the fridge without spilling. Add the steaks to the brine for about 2 hours, keeping them cold throughout the brining. Remove the steaks when brining is complete (do not rinse) and lightly pat dry with paper towels, then lightly sprinkle more rub on both sides. Allow the steaks to air dry on a wire rack (on a baking sheet, on your kitchen counter), until a pellicle forms. A pellicle is a skin or coating of proteins on the surface of meat, fish or poultry, which allow smoke to better adhere to the surface of the meat during the smoking process (this definition is directly from Wikipedia) – the salmon will look obviously tacky and shiny and it will take about an hour for the pellicle to form. Preheat your smoker to approximately 225 degrees F, add apple wood chunks to the coals and smoke the salmon for about 45 minutes or until the center of the fish reaches 130 degrees F. Allow it to rest for about 10 minutes then dive in – one of our favorite meals is simply this salmon and a big salad.